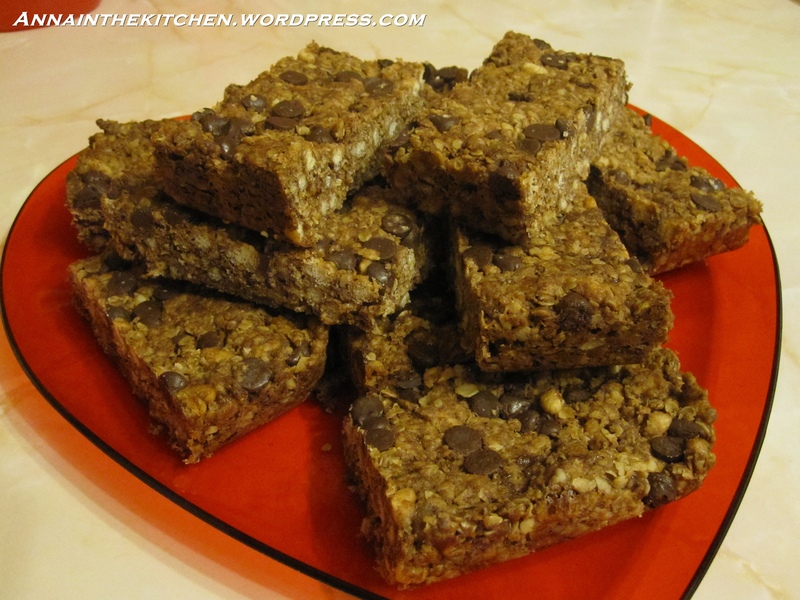 I’m rather fond of commercial cereal bars with chocolate chips in. Could eat an entire box full in one sitting if I let myself. 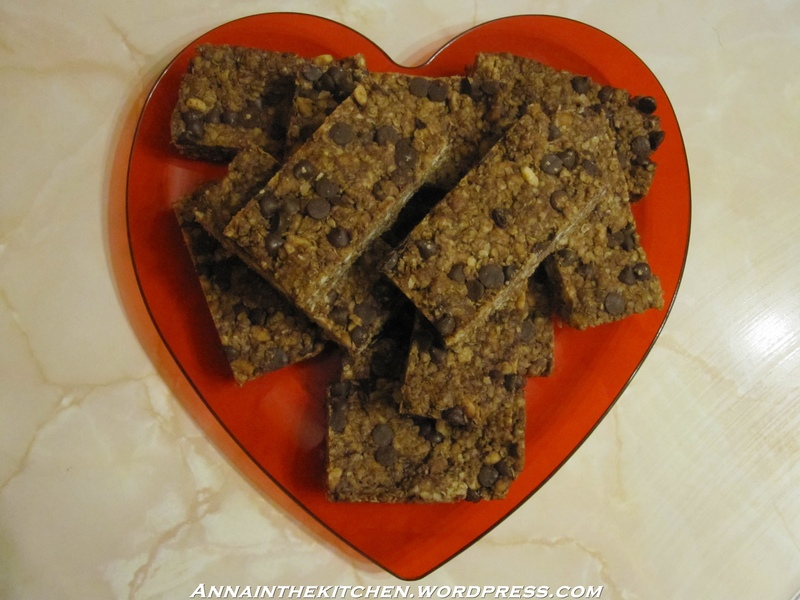 So it occurred to me that basically a cereal bar is flapjack and flapjack is easy! I’m still wavering as to whether or not it’s any cheaper to make my own considering the price of chocolate chips but making your own does mean you get more control. You want more chocolate? Add more chocolate. Too many crispies? Add less. I have to admit though that I am perfectly happy with the way the commercial ones are so I went for replication of ratios. However, if you didn’t like something then my point is it’s easy and homemade is for you. I’ll apologise for the pics also as I’m feeling rather unwell this evening and just wanted to get it done and go to bed. I’ve been having a problem with graphics all evening so if something hinkey is going on I’ll be back to fix it when I’m feeling better. G’night all! – Line an 11″x7″ brownie or anything else approximately the same dimensions with baking paper and lightly grease it. – In a medium to large bowl add the oats, rice crispies and flour and mix together. – Add the contents of the pan to the bowl and thoroughly mix until well coated and no flour is visible. – Add about 100-125g of the chocolate chips and stir through until evenly distributed. – Press the mixture into the prepared tin. – Scatter the remaining chocolate chips on top and continue to press down untilt he top is smooth. – Remove from the oven and allow to cool completely. – Lift out of the tin and peel off the baking paper. – Slice into whatever sized pieces you desire.